Each week we feature an app that has caught the attention of the Crozdesk community. We look for exciting features that make our lives easier, apps that take a radical approach to existing problems or a service that has everyone talking about it. In other words, apps that we think you should know about. 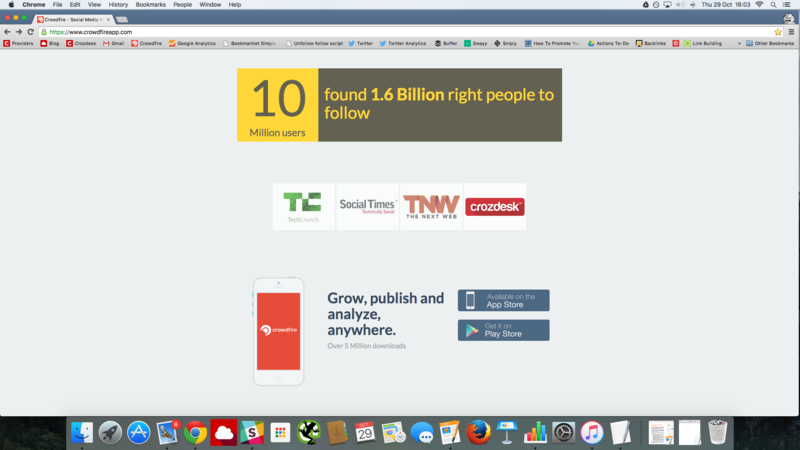 This week’s featured app is Crowdfire – a highly efficient social resource which allows you to get more Twitter followers and boost your profile on Twitter at the click of a mouse. The question of how to get more people to follow you on Twitter is highly relevant not only to people concerned about their popularity but also to businesses, whose Twitter and Instagram pages are a key touchpoint with their customers. As usual a cloud-based business software resource has come to the rescue in the form of follower-boosting app, Crowdfire. The app works in exactly the same way for both Twitter and Instagram accounts; for the sake of simplicity, this review will refer only to Crowdfire’s Twitter functionality, providing you with useful tips on how to use Crowdfire to get more people to follow you on Twitter. They say the simplest solutions are the best and this is certainly true of the useful social resource Crowdfire, which has been thoughtfully and intuitively designed to boost your social impact and allow you to get more people to follow you on Twitter. 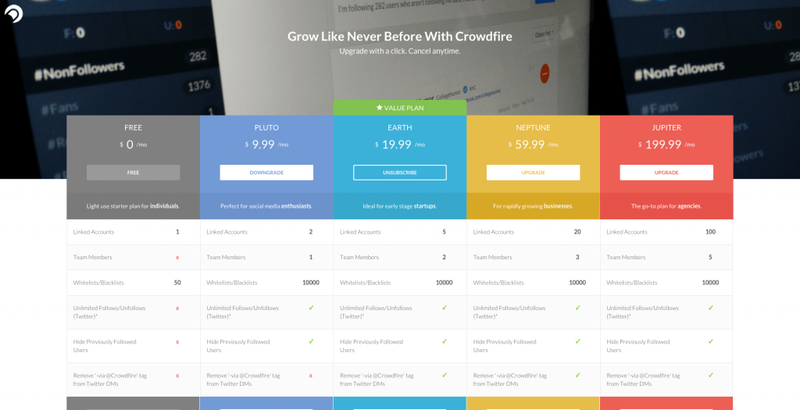 The first step is to visit the Crowdfire site and sign in with your Twitter account. The basic account is free and having signed in, you can get on with the happy task of increasing your Twitter followers. Non Followers function: The first step in your quest to get more Twitter followers is the Non Followers feature; this window displays a list of all the people in the “Following” section of your Twitter or Instagram account who do not follow you back. Crowdfire lists the number and identity of all such people and offers a handy one-click removal function in the form of a red minus icon next to each user. This function allows you to take a step closer to gaining more Twitter followers by removing those people that are not following you. Fans Function: If a high social status on Twitter is your concern, then you will need to pay attention to the number of fans you have. These are people who are following you but you aren’t following back; the more fans you have the more popular you are in the Twitter world. The Crowdfire Fans function clearly displays the Fans attached to your Twitter account, giving you the option to add these people to your Twitter account by clicking the green icon next to each user and in doing so boosting your Twitter followers. 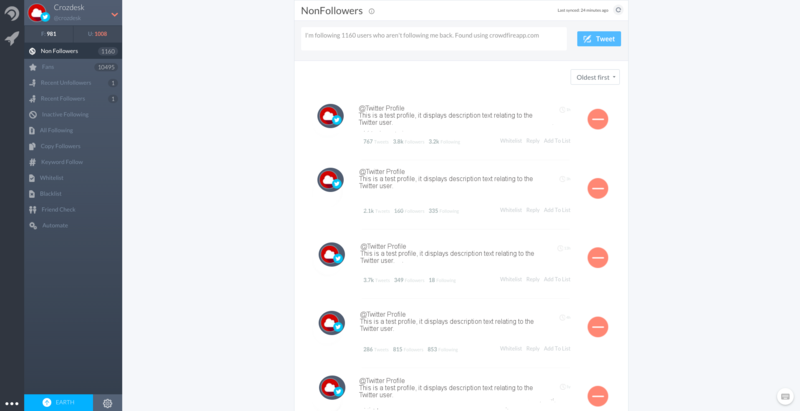 Recent Unfollowers and Followers functions: The next step on your journey to a booming Twitter following is the Unfollowers function on the main Crowdfire page. This lists those people which have unfollowed your selected account within the last day. You can choose to unfollow these people in order to keep your fan numbers up. Similarly, the Followers function displays those people who have followed your selected account within the last day; you can easily get more Twitter followers by choosing to begin following these people. Inactive Followers function: Another way to get more followers on Twitter is to boost your fan numbers by removing inactive or old followers. The Inactive Followers resource lists those people who are following you but whose accounts are inactive. You can filter this list by length of account inactivity, whether 1, 3 or 6 months. It is advisable to sort this list by the oldest first if you are planning on removing these followers, in order to avoid unfollowing people that you recently added. All Following function: This function is a complete list of people you are following from your selected account; you can sort the list by oldest or newest and get more Twitter Fans by unfollowing people that you have been following for a long time. Copy Followers Function: This is very useful resource in helping you get more followers on Twitter. Simply enter a Twitter user or handle and the window displays all the followers belonging to that particular handle. You can copy from similar accounts or competitors, gain active and interested followers and simply boost your twitter followers. As long as you are signed up to a paid plan, this function will automatically hides previously followed users. Keyword Follow Function: A recently added feature which is a great way of quickly gaining more Twitter followers from lists of people in your area of interest or field, without having to search for a particular handle from which to copy them. Simply enter a keyword into the box and you will see a list of people related to that particular keyword. Filter them by geolocation and then add them to your account to boost your Twitter followers. Whitelist and Blacklist Functions: The whitelist is a useful function allowing you to add safe or preferred people in your selected account. These people will then not show up on any unfollow list, preventing the possibility of your inadvertently unfollowing someone on the whitelist. In the same way people added to the blacklist, will not appear anywhere for you to follow. 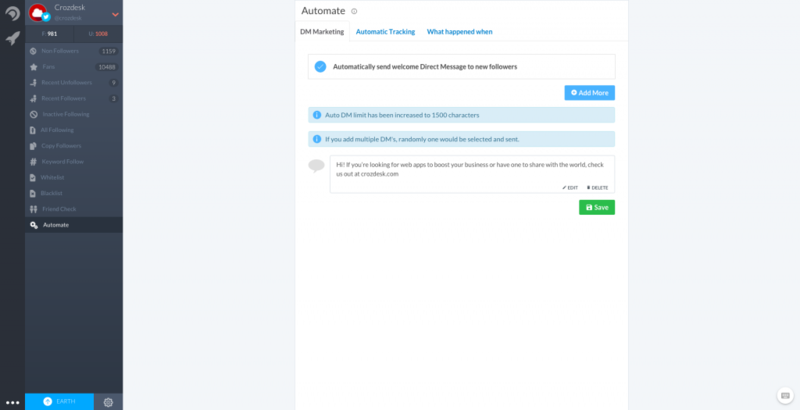 DM Marketing: This resource allows you to turn on and off an option to DM any new followers, and specify the message they will be sent. There is a 1500 character limit on DM’s. Automatic Tracking: This allows you to specify whether or not you wish to receive reports on your Twitter stats. This includes the option to recevie daily or weekly stat reports via email and also whether or not you wish these reports to include follower and unfollower stats. What happened when: Use this function to keep track of the latest automatic updates. In addition to the Automate function, the settings section in Crowdfire allows you to add or remove connected accounts, change card details and modify or upgrade your plans. Free: The free plan allows one linked account and a white/blacklist limit of 50 users. This is a light-use starter plan for individuals. Pluto: At $9.99 per month, this plan is designed for social media enthusiasts and offers 2 linked accounts, 1 team member and a white/blacklist limit of 10,000. This account also allows unlimited follows and unfollows and automatic hiding of previously followed users. Earth: At $19.99 per month this value plan is ideal for early stage startups and offers up to 5 linked accounts, 2 team members and in addition to all the functionality of the Pluto Plan, the option to remove “-via @Crowdfire” tag from Twitter DMs. Neptune: At $59.99 per month, this plan is designed for rapidly growing businesses and in addition to all the functionality of Earth, offers up to 20 linked accounts and 3 team members. Jupiter: A high usage plan designed for social media and communications agencies, this plan offers up to 100 linked accounts, 5 team members and all the functionality of the other plans. This plan is $199.99 per month. A range of price plans are available to suit all user groups, from personal users to social giants. 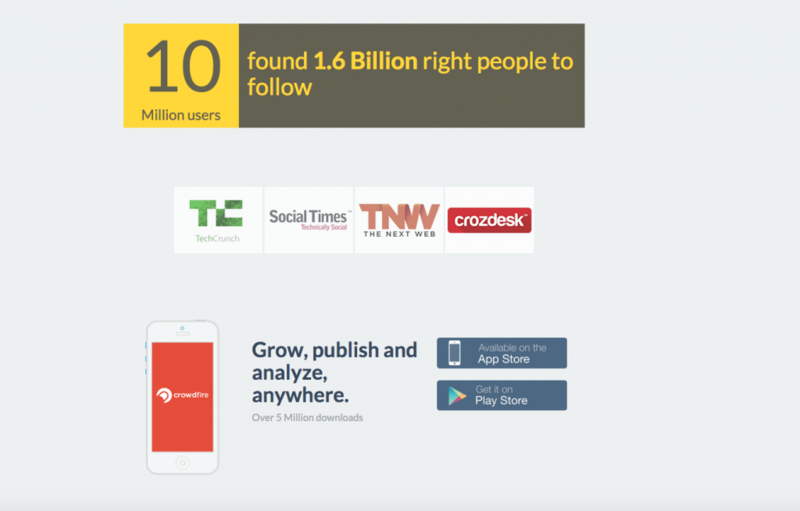 Crowdfire is a well constructed, efficient and no-nonsense SaaS solution to the challenge of getting more followers on Twitter. The app offers excellent value for money and is an essential tool for any individual or brand serious about increasing their social profile. 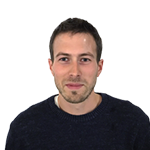 Tristan Cardwell is a London-based Copywriter and a Content Author at Crozdesk. He has a background in advertising and market research and degrees in English and Law.